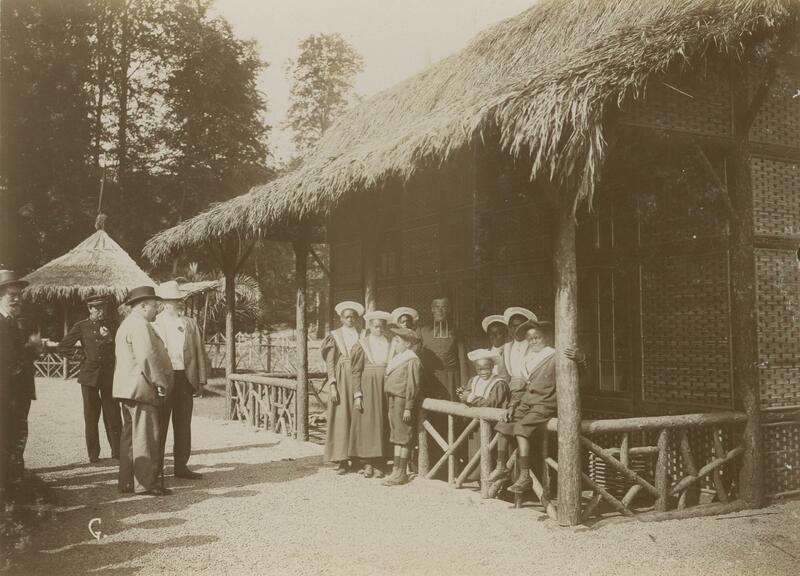 In 1897, Belgian King Leopold brought 267 Congolese people to his country estate to display them in a mock African village — a practice referred to as a human zoo. The site of the first Congolese "human zoo" is now where the Royal Museum for Central Africa now stands in Tervuren, Belgium. 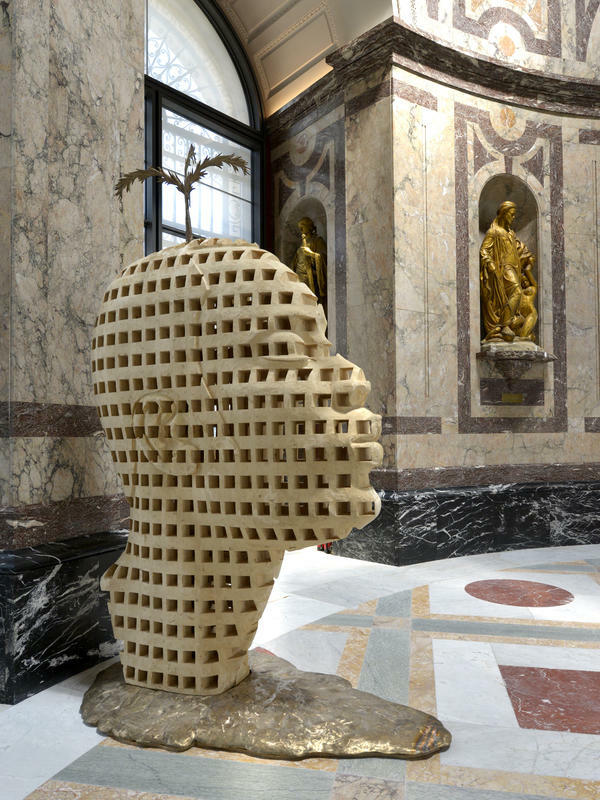 The Aimé Mpane sculpture "Congo, New Breath" will greet visitors to the remodeled Royal Museum for Central Africa when it reopens in December. So he set out for the place where he thought he'd find some answers: the Royal Museum for Central Africa in the Flemish village of Tervuren. "When I walked inside, it struck me that our history had been confiscated," he says through a translator. "That when our children come here, they would not see a positive image of themselves." They would see statues depicting Africans as primitives, their children clinging to the robes of heroic white Europeans. Among them was a giant sculpture of the bearded King Leopold II, whose history of brutality and racism was long hidden in Belgium. Growing up in the 1950s, even Guido Gryseels — the museum's current director — didn't know this history. "When we went to school, a lot of our teachers were former missionaries so the education that we got was that Belgium brought civilization to Congo — that we did nothing but good in Congo," Gryseels says. "We were all given a very favorable view of colonialism. I can't remember a single negative comment." Later, the spin turned to silence, according to Sarah Van Beurden, a professor of African history at The Ohio State University who grew up in Belgium. The University of Leuven, where she obtained her bachelor's and master's degrees, "did not have courses on colonial history, and this was the 1990s!" she says. Research by the University of Ghent, which revealed that Leopold's colonization caused mass death in Congo, was largely ignored. This silence is familiar across Europe. Even today, European countries that participated in the land grab known as the Scramble for Africa — which began in the late 19th century and became the largest such conquest in history — are unable to wholly face how ruinous colonization was for Africans. "In 1870, roughly 80 percent of Africa south of the Sahara was under kings, chiefs, traditional leaders," says American author Adam Hochschild, who wrote the influential book King Leopold's Ghost. "But 35 years later virtually the whole of sub-Saharan Africa was European colonies or protectorates or white settler-ruled colonies like South Africa." The 1884-85 Berlin Conference initiated the division of Africa among Great Britain, France, Belgium, Spain, Portugal and Germany. In Belgium's case, Leopold hired explorer Henry Morton Stanley to stake out the huge, mineral-rich land around the Congo River. Leopold also managed to persuade all the major nations of the world, including the United States, to recognize "Congo Free State," as he called it, as belonging only to him. Over the next 23 years, he reaped an enormous fortune by turning the Congolese into slave laborers to gather wild rubber. "Rubber grew wild throughout the Central African rain forest," Hochschild says. "[The king] took his private army, 19,000 men, and would send the soldiers from village to village. The soldiers would hold the women of the village hostage, in chains, and force the men of each village to go into the rainforest and gather wild rubber from vines that twined around the trees." Those who refused were killed. Soldiers punished men who didn't gather the monthly quota of wild rubber by hacking off their children's hands and feet. Millions died of disease, starvation or violence. Aime Mpane, the Congolese visual artist, read these accounts in Belgium with horror. He thought about the Royal Museum for Central Africa and its statues depicting heroic white men. "I thought to myself, 'They believe this is normal,'" he says. "I was shocked that people could think this is normal." The Royal Museum for Central Africa began as a temporary exhibition in 1897 in Tervuren, where Leopold had his country estate. The most talked-about part of the exhibition was the "human zoo" — a mock African village set up in the estate's woods and ponds. 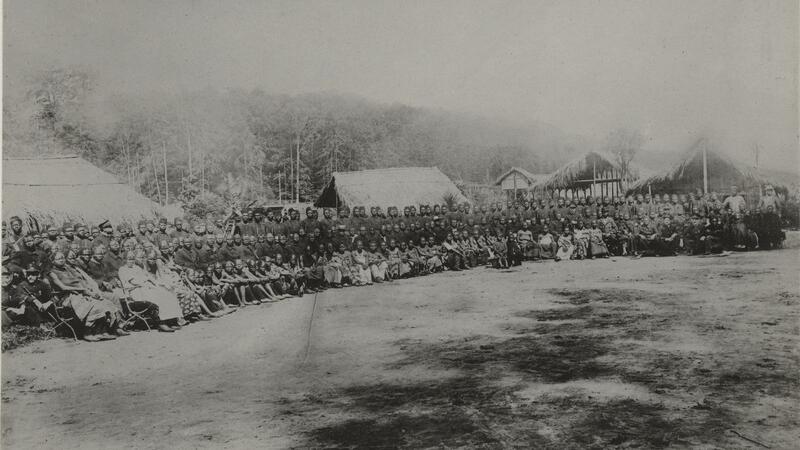 King Leopold, who never set foot in Congo, imported 267 Congolese men, women and children to Tervuren and displayed them behind a fence. "When Leopold heard they were getting sick because of candy they were eating that was tossed to them by the crowd, he put up an equivalent of a 'Don't Feed the Animals' sign at a zoo, saying, 'the blacks are fed by the organizing committee,'" Hochschild said in a documentary based on his book. Seven Congolese died of pneumonia and influenza at this human zoo and were buried in Tervuren. Marie-Claire Lusamba, a Congolese businesswoman living in Belgium, leaves flowers at their grave before exploring the serene park that used to be the human zoo. She says the racism she sees in Belgium is directly tied to colonialism. "If they acknowledge that, then we can move forward," she says. "Because it did not stop with Leopold and this human zoo." The king eventually hired French architect Charles Girault in 1904 to design a palatial neoclassical building to house the museum and its artifacts. Leopold burned most of his colonial documents before he sold Congo to the Belgian state in 1908. Fifty years later, Belgium built another mock African village at the 1958 Brussels world's fair. The Congolese who traveled to Belgium for the exposition thought it would be a cultural exchange, says Zana Etambala, a historian at the Royal Museum for Central Africa. Instead, they found themselves standing behind a bamboo fence, on live display for Europeans, some of whom made monkey noises to get their attention. "They were throwing bananas and peanuts to [the Congolese]," says Etambala, who grew up in Belgium and Congo. "And the Congolese protested against that. They wanted to be respected and not seen as animals in a zoo." Congo won its independence in 1960. In the late 1990s, Hochschild's book and a government inquiry into the 1961 assassination of Congolese prime minister Patrice Lumumba prompted Belgians to start digging into the dark side of colonial history. The Royal Museum for Central Africa, however, remained stuck in the 1950s. So in 2001, its trustees hired Guido Gryseels, an agricultural economist who had worked extensively throughout the African continent, as its director. "They brought me here just to reform it," Gryseels says. "Obviously, our colonial past is something that we have to deal with." The museum finally closed for massive renovations in 2013, after years of planning. "We walk a tightrope," Gryseels says, between those who fear this transformation won't go far enough and others who fear it will go too far. Ex-colonialists in their 70s and 80s, for example, don't want the museum to vilify them, Gryseels says. They believe they helped Congo. They learned local languages and married Congolese. Belgian diplomat Renier Nijskens used to speak on their behalf. "They wouldn't like to die being seen as ugly abusers, people who are associating themselves with an evil project," Nijskens says over coffee at a Brussels hotel. "They are convinced that the Belgian Congo was not an evil project. They felt like a father who had to take good care of kids. And when the kid would grow, he will fly his own wings and go away. And they had the sense that this was the normal course of history." Belgians of Congolese descent are appalled by this paternalism. Some want to close King Leopold's museum or cut him out altogether. "Everything in that museum belongs to the Congolese," says art curator Cesarine Sinatu Bolya. "King Leopold was a madman." Bolya is seated at a restaurant in Matonge, the most interesting neighborhood in staid, Eurocrat-filled Brussels. Matonge is named after a part of the Congolese capital Kinshasa, and was settled by Congolese immigrants. Bolya is sharing spicy vegetables and beers with a novelist, a cartoonist and a singer who belts out a love ballad that Bolya describes as "very dramatic." Bolya works with a nonprofit that records Congolese oral history. "I do not believe this museum can decolonize unless Congolese are in charge of it or unless the artifacts are returned to Congo," she says. In the end, there was compromise. Some of the old exhibits remain, but now they come with explanations about Leopold's brutality. The museum space is also double its previous size, with a new building that includes exhibits on Congolese history and culture. The renovation is expected to cost nearly $90 million (75 million euros). "We want our museum to become a forum for people to share history," says Gryseels, the museum director. "We are creating a gallery for the Congolese, where they'll be able to bring their own memories and archives. There will be a timeline about Africans in Belgium, what brought them here, what are their interests, their frustrations. They themselves will fill up this gallery." At first, this talk of shared history wasn't enough to encourage Aime Mpane, the Congolese visual artist. He kept thinking about the prominent statues depicting Leopold as a noble man and European missionaries as heroes with black children clinging to their feet. "When the museum began the rebranding, they asked me to participate," he says. "But I didn't want to. I didn't think it would do any good. Then I was told about a competition to replace King Leopold's statue with an original work." Here was a chance, he told himself, to reclaim a small bit of history. Mpane won the competition. His monumental sculpture "Congo, New Breath" depicts a human rising from the rooted earth and looking to the sky. And when the Royal Museum for Central Africa reopens at the end of this year, it will be the main statue visitors see. News researcher Susie Cummings contributed to this report.